The award-winning Snuzzler provides the ideal support for babys back and head, adjusting upward as baby grows. 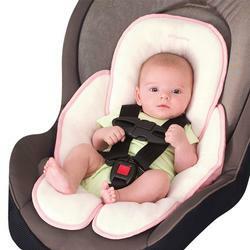 The unique contours work well with all harness systems and the Snuzzler transfers easily to provide support for baby in car seats, strollers, jogging strollers and swings. 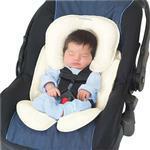 With padding only on the sides, not behind baby, the Snuzzler does not interfere with the safety of car seat harnesses. The Snuzzler reverses from plush velboa to smooth woven fabric for two distinct looks.